Global Warming Deniers and All Fossil Fuel Users: You Are Collectively Putting Us All in Very Grave Danger! The first five months of 2015 topped the warmest such period on record for the globe, according to a pair of recently released independent analyses from government scientists. Meanwhile, a third, separate analysis from the Japanese Meteorological Agency similarly found May 2015 to be the globe’s hottest May, topping May 2014 in records dating to 1891. Global temperatures January-May 2015 exceeded 2010’s as the warmest first five months of any year, according to the National Aeronautics and Space Administration’s (NASA’s) Goddard Institute for Space Studies. The National Oceanic and Atmospheric Administration’s (NOAA’s) National Climatic Data Center noted that the first five months of 2015 nudged ahead of January-May 2010 by 0.09 degrees Celsius. Record warm sea-surface temperatures in the northeast and equatorial Pacific Ocean, as well as areas of the western North Atlantic Ocean and Barents Sea north of Scandinavia contributed to the record warm January-May 2015, according to a recently released NOAA data set. The record global average warmth in the first five months of 2015 follows the record annual average global temperatures of all of 2014. NASA’s analysis found the most pronounced warm anomalies in May 2015 were over the higher latitudes of the northern hemisphere in two zones. One stretched from northern and central Russia into the Kara Sea, Barents Sea, northern Scandinavia westward toward northeast Greenland. Another was centered over northeast Alaska, and Canada’s Yukon and Northwest Territories stretching into the Beaufort Sea. Record May warmth was also observed in parts of equatorial South America, southern Africa and The Middle East, according to NOAA. Spain tallied its second warmest May on record. Meanwhile, the heat wave death toll in India in the latter part of May topped 2,300, as was reported in a blog posting here last month that also reported on the death toll of Pakistan’s heat wave last month. In fact, no U.S. corporation-funded major public media (T.V. or radio, including ABC, NBC, CBS, FOX and NPR) devoted any of their prime time broadcasting in Madison, WI to this story. This is not surprising, of course, knowing that all the major media networks in the U.S., both public and private, as well as many U.S. politicians who claim they represent the public, depend heavily on monetary sources from the major automobile, trucking, airline and fossil fuel providers/refiners/distributors and fossil fuel related industries. Nine of the ten warmest years in NASA’s 134-year database have occurred this century, with the exception of 1998, which featured the tail end of one of the strongest El Ninos on record. 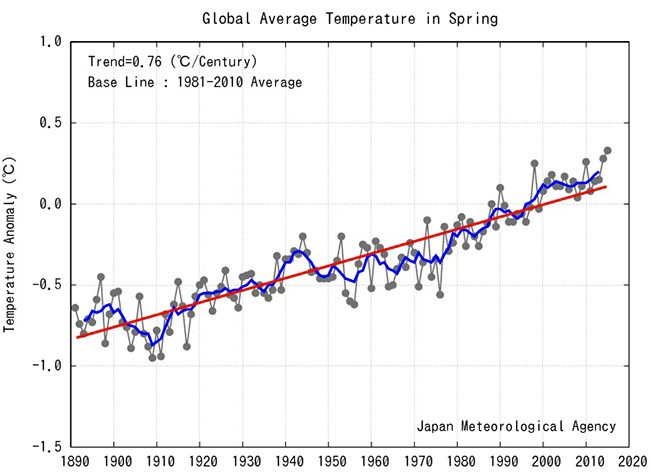 The last year NASA’s data set of global average temperatures was cooler than average global was 1976. The last cooler-than-average month was over 21 years ago, February 1994. In the 449 months from January 1978 through May 2015, only 11 months have been cooler than average, according to the NASA data set. France to see worse heat wave than occurred in 2003 when thousands of people died. France’s southwestern Gironde region sweltered under 107-degree F. heat a day after Cordoba in Southern Spain recorded nearlt 111 degree temperatures. For noncorporatized REAL news, see news schedule at WORT-FM Community Radio – Madison, Wisconsin, and Democracy NOW!.